When fire scientist Albert Simeoni wants to study wildfires, he can’t exactly run into the nearest blaze with sensors and data collection tools. It’s simply too dangerous and these conflagrations, though they’re becoming more frequent and intense with climate change, aren’t predictable enough to research in the controlled manner that science demands. But he and his fellow fire protection engineers at Worcester Polytechnic Institute in the US state of Massachusetts have designed a solution: a wind tunnel where they can burn all sorts of materials under different conditions to see how they respond. It’s helping them develop new ways to manage forests and design fire-resilient communities—although in the country's current funding environment, actually implementing this critical research is proving to be an uphill battle. “It’s very difficult to study a fire while it’s happening,” Simeoni said in his pronounced French accent. Unpredictable weather patterns, uncertainty regarding how different layers of vegetation burn, topography, local residents and nearby buildings are all elements that change the fire. Not to mention the importance of everyone, researchers included, staying out of the way of firefighters trying to save lives. Field research does happen—for instance, when Simeoni became a fire chief at his volunteer fire department in France, he’d sometimes put sensors on his firefighters—but for the most part, the best way to study wildfire is in what Simeoni calls “sealed experiments”. That means prescribed burns and lab studies, the latter of which allow very specific variables, like wind or vegetation type, to be studied in isolation. Simeoni has been studying fires at WPI for a year and a half, and he built the wind tunnel last year. Essentially a large glass box, the bottom of the tunnel is removable so it can be operated in the lab with materials the team brings in—mostly, vegetation from the Worcester area—or taken out to the field and placed over vegetation. Right now, the researchers are using the wind tunnel for two basic but essential studies. First, in conjunction with the University of Notre Dame, they’re burning dowels made from different types of coated, lightweight wood often found in hardware stores to watch how the flames spread between fuels. While burning these dowels, they’re also looking at how the wind moves and changes the way the fire spreads. Simeoni’s hope is that the results of this research will help communities become more fire-proof. The recent destruction of Paradise in the US state of California by the Camp Fire underscores just how high the stakes are. “For most places I firmly believe it’s a design problem,” Simeoni said. “We see a domino effect in these communities. You ignite the first row of houses and then you lose the whole community.” He believes there may be better ways to engineer towns so that if a row of houses does catch on fire, it doesn’t spread and take out the entire neighbourhood. The second set of tests he’s performing in the wind tunnel are on vegetation. Specifically, how do different types of plants affect wind patterns? While normal wind tunnels are designed to produce smooth wind patterns, this tunnel can mimic gusts and turbulent conditions. 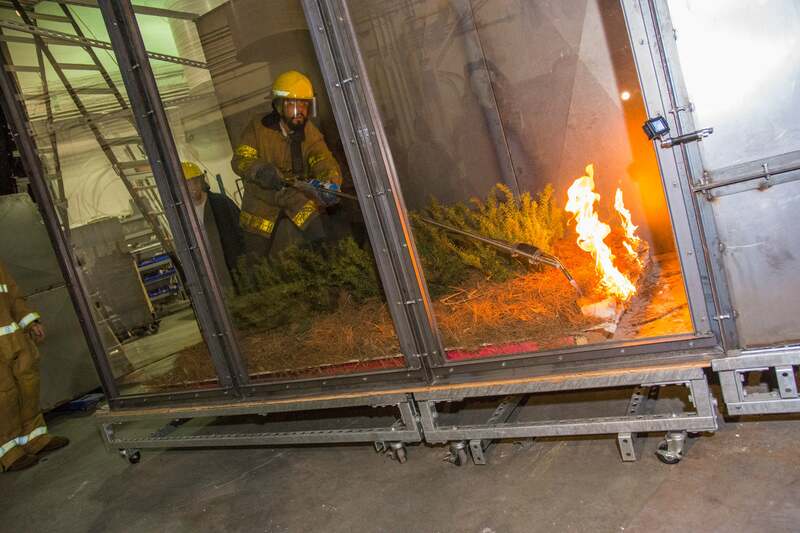 For these tests, the bottom of the tunnel can be removed and the entire rig can be brought out to the field to burn real vegetation. The challenge with all of this, Simeoni said, is that even though they are learning a lot about wildfire and how it works, there is currently no systemised, government-funded pipeline for relaying the information they’ve gathered to the public. Simeoni noted one federal government programme, the Joint Fire Science Program, that’s dedicated to delivering research for implementation in America. But it’s lost significant funding over the years. In 2012 the programme was funded at $13 million. It was originally slated to be abolished in proposed versions of the 2019 budget by the Trump Administration, but some funding was restored. The Office of Wildland Fire, which coordinates budget and policy for the US Department of the Interior’s fire programs, said that, while the 2017 total budget for this program for both the Department of the Interior and the US Forest Service combined was $9 million, in 2018 that dropped to $3 million and funding came only from DOI. Funding for 2019 is dependent on final congressional action (and the Trump Administration’s budget proposal, once again, eliminates the programme entirely). The diminishment of this program comes as climate change is upping likelihood of large blazes and causing the cost of wildfires to skyrocket. Before 2000, Simeoni says, the costliest wildfire in the US was the 1991 Oakland fire, at $1.5 billion. The cost of the Camp Fire is not yet certain, but could be upwards of $10 billion. With little governmental support for further research into how fire conditions are changing and how we can adapt, we’re essentially flying blind into a more dangerous future. Erin Biba is a freelance journalist focused on how science and technology intersect with climate, the environment, and human health.